Not accepting immigrants is no longer a choice for South Korea, as it faces a shrinking working population. But the country, a homogeneous society ethnically, linguistically and culturally for so long, must devise a well-advised policy in order not to follow the same path as Europe, which is struggling with social problems related to immigrants. The economic benefits of an open-door immigration policy look clear. The country is going through a population crisis, with its birth rate remaining one of the world’s lowest and the economically active population -- made up of those aged between 15 and 64 -- starting to shrink for the first time this year. It is set to become an aged society in 2018, with people aged 65 and older making up 14 percent of its population. But Chung called for “controlled” immigration -- selectively accepting highly educated and skilled foreign professionals into the country, while phasing out the current policy of importing low-skilled migrant workers. “If low-skilled, low-waged workers stay for a long time here, they are likely to form the low-income bracket in society and the government will have to shoulder the expenses of providing welfare to them,” she said. At the same time, the country must work seriously on how to integrate those immigrants into Korean society, Chung said, stressing the task would be critical for the country’s future. “Immigrants do not automatically integrate into society and even (the second generation) who are born and raised in the country of relocation won’t,” she said, citing Europe as an example of this. In European countries, the rise in acts of terrorism -- those committed by Muslim extremists born and raised in the countries -- has raised public anxiety over immigration, with conservatives blaming the open-door immigration policy as the root cause of an increase in social unrest. Currently, South Korea has a narrow-minded and short-sighted approach when it comes to immigration, centering on multicultural families, or immigration through marriage, and the import of cheap labor from neighboring countries, Chung added. The immigration policy should target more diverse types of immigrants, such as ethnic Koreans, foreign students and refugees, she said. “A certain target group should not be singled out as a vulnerable group in need of help and the policy approach to them should be in line with a wider immigration policy,” Chung said, referring to the country’s focus on foreign spouses. In 2016, there were some 152,374 people who moved to Korea due to marriage. In 2014, South Korea ranked 18 out of 38 in terms of the migrant integration policy index, which measures each government’s policies to promote integration of migrants in 38 countries including the US, EU member states and Japan. “To draw up and implement a comprehensive immigration policy, there is a need to set up an independent body with its own budget to take charge of adjusting relevant ministries’ overarching tasks,” she said. As for the issue of migrant laborers, the chief of the IOM MRTC noted the problems of the current Employment Permit System. The EPS was introduced in 1993 to bring in foreign workers in the short term for low-skilled positions -- so-called “3-D” jobs shunned by locals for their dirty, dangerous and difficult working conditions -- to solve labor shortages mostly in the manufacturing and construction sectors. While the system has alleviated the labor shortage at small and medium-sized businesses, the availability of cheap labor has also hurt the quality of jobs such as pay and working conditions, she said. Migrant workers and their advocates have also long taken issue with poor working conditions, low pay and discrimination at workplaces. They even call it modern-day slavery, as migrant workers are not allowed to freely change their workplaces or extend their stay in the country without approval from their employers. “When foreign workers gain skills and expertise, they should be given pay raises accordingly and a chance to reside here longer and bring their families to settle here,” she said. The government is already moving in such a direction. The Justice Ministry said it would allow low-skilled workers only to work here for up to nine years and eight months. These low-skilled workers are holders of the E-9 visa (for low-skilled workers from 16 Asian countries), the E-10 visa (for workers in the fishing industry) and the H-2 visa (for ethnic Koreans from China and Central Asia). It adopted a point system to allow workers with proven skills to switch to the E-7-4 visa for a longer stay. Chung also called for a tougher crackdown on employers who hire foreigners staying here illegally. There were some 209,000 people, about 10 percent of the foreign population, illegally staying here without valid visas in 2016, according to Statistics Korea. The IOM MRTC was set up in 2009 through a partnership between the Korean government and International Organization for Migration. 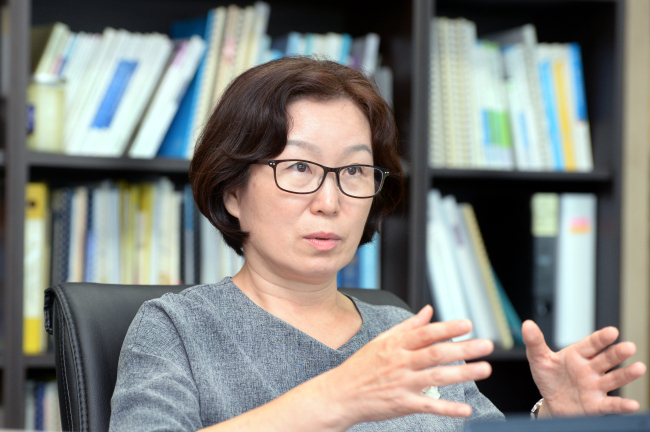 Funded by Seoul’s Justice Ministry, it conducts research and training to promote the understanding of migrants and migration issues, as well as offers policy advice to the government.